Once again I am back after a long break, I was away but as they say better late than never. Incidentally some of you maybe confused at receiving an update but not finding anything here on my blog, I noticed an increase in my statics on March 24th, a clear indication that several visitors came looking for a new post. I will clear the confusion, my laptop has a mind of its own, while I was working on this post the cursor jumped and hit 'Publish' and my incomplete post got published. I had to immediately delete the post, I apologize for all the confusion that I unwittingly caused. Right from my childhood I have noticed that the roles which attract the attention of the audience are author backed roles. My father's role in Anupama was so good that it overshadowed almost all his other films. Tarun Bose became synonymous with Anupama and Gumnaam. My father was not the first choice of the film’s makers. The film was first offered to Ashok Kumar, he turned it down, why? I have no clue. Then they approached Abhi Bhattacharya, he turned it down because he did not like playing a father, finally they offered the role to my father. Everybody knows the story of Anupama but all the same I will very briefly narrate the story. Mohan Sharma (my father) is a middle aged man, who marries a little late in life. He is deeply in love with his wife but unfortunately his wife (Surekha Pandit) dies while giving birth to their daughter. Shattered he detests his daughter blaming her for snatching away his beloved wife. However when drunk he expresses his love for her, by showering her with gifts which she is too frightened to accept. Given the circumstances, his daughter Uma (Sharmila Tagore) grows up to be a quiet, diffident woman always afraid of her father. In sharp contrast there is Annie (Shashikala) who like Uma is the daughter of a widower (Brahm Bhardwaj) but is absolutely pampered by her father. Along the way, Uma meets Ashok (Dharmendra) – a writer- and they begin to silently love each other. Sharma on the other hand dislikes Ashok. Sharma is keen to get his daughter married off to Arun (Deven Verma) his friend’s son, but Arun has fallen in love with Annie and refuses to marry Uma. Dismayed but not willing to accept defeat Sharma arranges his daughter’s marriage with someone else but Uma now gathers courage and decides to confront her father. She seeks his blessings so that she can set up her home with the man she loves. While everybody praised my father for his performance, particularly his expression, my father praised Hrishikesh Mukherjee, my father said, “It was the way Hrishida had conceptualized the scene, it enhanced my performance.” With regard to this scene Mukherhee said, “In order to get the desired effect, I had taken Tarun all the way to a station near Karjat”. He was unable recall the name of the station, Karjat incidentally is a town near Bombay. 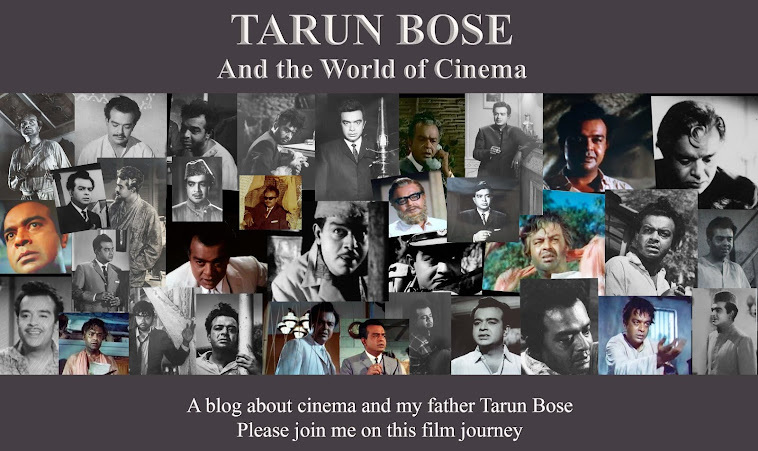 The final scene had made and continues make a lasting impression, people say “Tarun Bose? Anupama and that last scene, that face, who can forget that”. Of course I agree my father’s expression was truly unforgettable. There is another scene in Anupama where you get to see Hrishikesh Muherjee’s mastery over his craft. It is the scene where Sharma is waiting in the hospital for news about his wife. then the fear, as he watches the nurses and doctor rushing around. The build up to the death scene is done very subtly, there is no melodrama. Sharma looks nervously at the patient who appears to be seriously ill.
there is just the sound of the doctor’s footsteps as he comes down the stairs and he finally breaks the bad news. Now the silence is broken by the background music, as the camera moves up, the top shot shows the lonesome figure of the man who has suddenly lost the one person whom he loved the most. You can watch this scene in the clip below. Anupama was a perfect film but there was one thing though, I just did not understand why Mukherjee chose Shashikala for the role of Annie. She looked old, in real life too Shashikala was at that time a mother of two grown up daughters. Personally I felt that the role would have been perfect for Tanuja, she was very young then just the right age for that role and I know Tanuja would have done a perfect job as the talkative and playful Annie. But then that is my opionion. Sharmila Tagore was superb in this film despite her hairdo, she spoke with her eyes. When two actors work as a team and do not compete with each other, it really helps to create a wonderful impact, that is what happened in Anupama, Sharmila Tagore and my father complemented each other. Sharmila’s reaction to my father was so natural , the apprehensive look, the way she panicked every time her father berated her (watch the clip below) went on to create a wonderful impact. My father used to say that Hrishikesh Mukherjee was one of those directors who knew how to explain a scene and knew exactly what he wanted from his actors. I was never interested in being a film journalist, because I did not like the idea of chasing film stars and other film people for interviews, I was therefore quite happy with the kind of journalism I was doing, but there were a few people whom I wanted to interview and one of them was Hrishikesh Mukherjee. I knew it would not be difficult to interview him, he was more or less retired which meant I would not have to interview him at some far flung studio. He lived conveniently close to my home. He had this charming little sea-facing bungalow at Carter Road in Bandra one of the sububs of Bombay where most of the film people have their homes. It is not surprising therefore that you could see Bandra in several of Mukherjee’s films. Mukherjee sold the bungalow not very long after I interviewd him. Today a high rise stands in its place. Now thanks to that interview I am able to share some interesting trivia with all of you. Before I go into what Mukherjee shared with me, I have something else to share. I had accompanied my parents for the silver jubilee function of Anupama at the iconic Royal Opera House, where the film had its jubilee run. After the trophies were presented a show-reel of L.B.Lachman’s films was screened and naturally some scenes and portions of some of the songs from Anupama featured in the show-reel, one of the songs was Kuch dilne kaha ( a beautiful song). As soon as this song appeared on the screen my father and Deven Verma – he and his wife Roopa (Ashok Kumar’s daughter) were seated beside us – laughingly began to point out that both Sharmila Tagore and Dharmendra appeared to have slightly swollen eyes. This song was shot in Mahabaleshwar the lead pair had to wake up very early at about 4 in the morning, from what I overheard and if memory serves me right (it was a long time ago) the director wanted to catch the morning sun at a particular time. I knew he was acting and not really drunk. I saw the film in various stages in trial shows and every time his drunken scenes came I just put a handkerchief in front of my face and saw the scenes through the handkerchief as if the barrier of the handkerchief would diminish my father’s drunken state. Looking back I feel like laughing now. Often film-maker’s get some unit member to do a scene, in Anupama you see the film’s screenplay writer Bimal Dutt (above) appearing briefly in a scene. Bimal Dutt was Mukul Dutt’s (Aan Milo Sajana’s director) elder brother. Although this post is about Anupama and not Anand I would like to share something interesting that Mukherjee told me about Rajesh Khanna. No producer or hero was willing to touch Anand because the hero did not have a heroine and the hero dies at the end. Rajesh Khanna however insisted on a narration of the story, the moment he heard the story he, according to Mukherjee, jumped with joy. Mukherjee wanted to complete the film in three months. Rajesh Khanna agreed to give him 20 days in those three months. Mukherjee recalled that Rajesh Khanna got so involved that he began offering dates even when it was not possible for him to shoot, so where most film-makers have to chase actors for dates Mukherjee would say "bhago Rajesh aa raha hai date deneke liye". Although he had more or less given up films and had moved on to TV serials, out of curiosity I asked him whether there was any subject or story on which he would have liked to make a film. He replied that there was a subject on the pilgrimage spot Hinglaj which is located in Balochistan, he was keen to do the film but did not get permission to shoot there so he dropped the idea. Another story which he was unable to film was Ganga. Ganga was written by Hrishikesh Mukherjee himself, he said, “It has been one of my pet subjects. It is about a man who wants to know why the river Ganga is so sacred to the people of this country. He therefore sets out travelling along the route of the Ganga.” He wanted to make this film with Ashok Kumar in the lead role. Ashok Kumar too was very keen on doing it, he had told Mukherjee, “Once I do this film, I will announce my retirement, for I will have no wish to do any other role after doing this”. Ganga remained an unfulfilled dream for both Hrishikesh Mukherjee and Ashok Kumar. Before I conclude this post there is something else that I would like to share. Few years before my father passed away he had started collecting Ganesh idols, actually it all started with the idol you see below, this was gifted to my father by Hrishikesh Mukherjee. Initially I had decided to wind up this blog with Anupama, but then I realized I had some memorabilia with me, I would like to share these with you all, besides that I would also like to share an interesting interview with cinematographer Kamal Bose. In my next post I will unlock some more memories. When I will be able to do that I am not too sure because time is a major constraint. Those of you who follow me will get an update and those of you who are my facebook friends will see an update on facebook. So please bear with me. I think it is fair to say that despite the film's name, your father was the face of Anupama. It truly was Abhi Bhattacharya's loss that he did not sign it. Kehte hain, daane daane pe likha hai khanewale ka naam. This role was destined to be your father's. He was fantastic in the film. p.s. Your father collected Ganesh idols? :) I do, too. I began when I was 19 and someone gifted me a little pillayar (as he's called in Tamil Nadu) carved from a betel nut. Now I have quite a vast collection. In this case this dana would no way be in Abhi Bhattacharya's naam for there was no way he was going to do a father's role no matter how good the role, that is what I heard. That would be wonderful, looking forward to it. I knew you all would enjoy all this interesting bit of trivia, unfortunately my father went away too soon, had he been around a little longer till I had grown up a bit I would have had many more interesting trivia because back then I wasn't old enough to ask him so many questions. I had just begun asking questions when one fine morning he suddenly left us. Thankfully mum was around for a long time to fill me in, though she too did not have the answers to all my questions. Again a wonderful post, dear Shilpi! Loved the description of the Anupama scene. The way your father looks longingly at the stairs for the news of his wife, the stairs, where he laso got the good news of the birth of his daughter, is very touching. Thank you also for the other wonderful trivia. Thanks Harvey, that scene is one of my favourite scenes. Thanks for sharing your memories & honoring your dad. The clips in this and several other posts are broken: the links are not available or clicking on them does nothing. Will you please fix it? Thank. You see, Tube Chop no longer functions, we need to therefore upload clips on YouTube, that is a bit time consuming. Maybe when we get the time we may do it, in the meanwhile you can see the film on YouTube.